My favorite recipe for sweet potatoes. Make this into a new favorite on your family's Thanksgiving table too! Preheat oven to 350 degrees. Pierce potatoes with a fork and place on a rimmed baking sheet lined with foil. Bake at 350 degrees for 1 hour or until tender. You should be able to easily slide a fork into the potatoes with no resistance. Let the sweet potatoes cool until you're able to handle them. Remove skins and discard them. Mash the sweet potatoes. Mix brown sugar, melted butter, orange juice, cinnamon, salt and nutmeg. Stir into sweet potatoes and spread them evenly in a 9"x11" casserole dish. 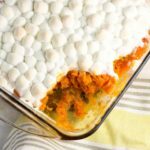 Sprinkle marshmallows on top of the sweet potatoes and put them into the 350-degree oven just until they're puffed up, about 15-20 minutes. Complete steps 1-3, then cover casserole dish in plastic wrap. Place in the refrigerator for up to 24 hours. When you're ready to heat up the sweet potatoes, remove casserole dish from refrigerator, remove the plastic wrap, and let sit at room temperature for about 15 minutes. Preheat the oven at 350 degrees. Place in the oven for 30 minutes, until heated through.